I've decided to offer online violin lessons and viola lessons. This is because several people who read some pages on this website about how to eliminate tendonitis, tensions and aches and pains caused by violin and viola playing, how to eliminate stage fright and improve their tone, were interested in having lessons but they were too far away from me. My teaching is based on the New Approach to string playing developed by Kató Havas. Read about it so you'll be ready to book your 6 lesson (2 hours each) or 12 lesson (1 hour each) course, yes, because having just one one-off lesson doesn't make much sense, what can you really learn? I like to have students who understand what's special about what I teach so I recommend you to, at least, read Stage fright or watch the teaching DVD. It is really possible to organize online lessons and not difficult at all, I've been experimenting for a while and it works. I'm offering up to 30 minutes free online violin lessons or viola lessons to set up everything the first time. You'll receive your own personalized live online music lessons, not like those recorded videos of online violin lessons that you can find, but where you can't ask any questions. In my case, it's exactly like having a face to face private lesson, but you can have it without leaving your home, wherever you are, you don't have to travel from the other side of the world (only, check the time! the clock shows mine). Or beginners have to suffer for months or years the torture of that horrible "beginner sound" (I'd rather call it "noise") and inflict this torture on their family and neighbours. The New Approach principles can be learned and applied by everybody, especially violinists and violists, either teachers, students, professionals or amateurs. The New Approach principles can also be applied to other instruments. 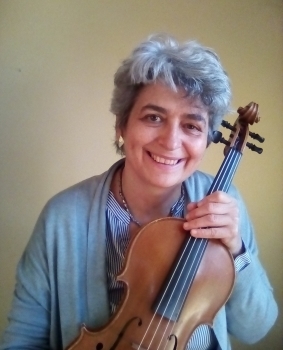 They are not just for classical players, but also for fiddle players so I can offer online violin and fiddle lessons and for players of any other style. Have A Great Story About Online Violin Lessons?